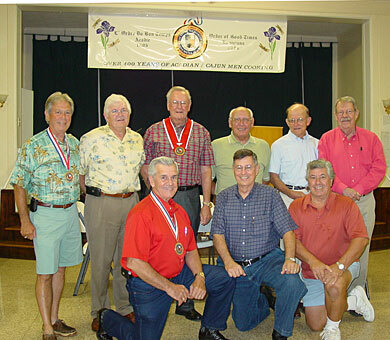 The Acadian Memorial's “L’Ordre Du Bon Temps" (Order of Good Times) hosted a barbeque social on Saturday, July 28th, 2007 at Veteran’s Memorial in New Iberia. That day was set aside to celebrate historic “L’Ordre Du Bon Temps” & reflect on the “Day of Remembrance”. Front Row kneeling left to right: Terrel Dressel, Ernest Freyou, John Allen LeBlanc Back Row standing left to right: Ray Trahan, Ernest “Topper” Breaux, Preston Guillotte, August “Butch” Dupuis, Larry Roy, John Albert “Al” Roy. In 1604, after a first near failed attempt to create a hamlet in “Acadie” (present day Maine), Samuel de Champlain moved the settlement area to Port Royal, (present day Nova Scotia) in 1606. It was here that the eating club began to help the men survive the harsh cold and depressing winters, in hopes to solidify the new colony in North America. The project succeeded and the Acadians lived and loved their “Acadie” for more than 100 years. In 1755, after many years of struggle with the British, a final order to deport the Acadians ruined the beloved homeland of the Acadians. During the L’Ordre gathering, the Acadian Memorial membership and guest celebrated the colonization of “Acadie” and paused to reflect on that dreadful day, July 28th, 1755, where it all ended. At exactly 4:15 p.m., the group gathered outdoors for a moment of silence as the nearby New Iberian Catholic Churches tolled the church bells for one full minute. It was a somber instant when each person became more aware of that poignant time in Acadian history. After a great meal, Marcelle Bienvenu, spoke about the book, “Stir the Pot: The History of Cajun Cuisine”, which she co- authored with Dr. Carl Brasseaux and Ryan Brasseaux and John Albert “Al” Landry, artist and author shared humorous stories from his new book.“Hoorah Plantation – 1930-1945". Cajun band, Kyle Huval & Acadie played old fashion Cajun Music as the membership completed a great evening by dancing the night away. On November 10, 2007, at the Petroleum Club, come share in the fun at the next “L’Ordre Du Bon Temps” event, the annual Gala. Call 337.394.2258.